Location: We THANK Outsiders Inn for sponsoring the Columbia Bank Community Room at 101 E. 6th St & Main, Vancouver, WA 98660. The Columbia Bank staff, as always, were gracious and the space was perfect for a welcoming professional meeting. 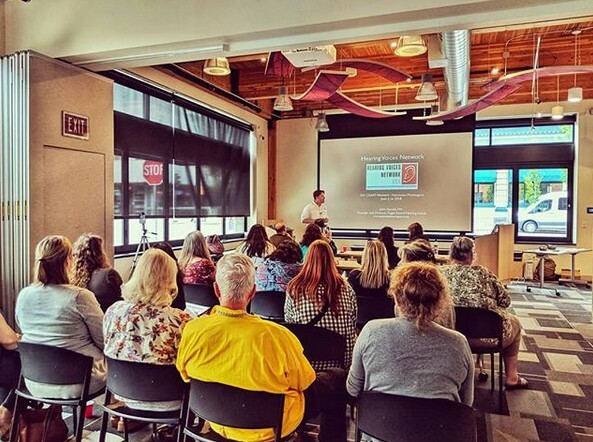 It was a lovely evening as we gathered to listen to John Herold, MA from Puget Sound Hearing Voices share his story about alternative approaches to traditional, mainstream attitudes toward “mental health” that could be completely non-pathologizing. He thoughtfully shared, "I do not view unusual ways of experiencing, perceiving and expressing through the framework of “mental illness.” Instead, I view out-of-ordinary states and emotions as potentially meaningful, as containing something important to be safely explored and thoughtfully integrated." Our Resource Roundup guests added to the depth of local resources information we gathered! Tracey Jennings, Program Director of the CVAB Reach Center shared about the various Groups and Programs that CVAB has. CVAB stands for Community Voices Are Born and is all about peer-to-peer support. Everyone who works there has some kind of lived experience in either mental health and/or addictions recovery and is ready to support those who are vulnerable or in crisis, or wanting to experience healing, recovery and wellness. Michelle Kinney, Peer Counselorat CVAB shared her story of finding connection through the Reach 2 Program and how she is now continuing her recovery journey and professional growth through opportunities found through various other CVAB programs. She invited us to come on down to the Community health Building at 1601 E. Fourth Plain Ave in Building 17 and use a computer, join in a support group, or experience feeling encouraged. Sarah Wilson, MSW shared information about PeaceHealth's ADAPT Day Hospital Program. ADAPT stands for Awareness Directed Activites for Personal Transformation, and is based on the belief that people can and do recover from mental illness. The goal of care is to partner with people in making choices that lead to recovery and that the individual directs every aspect of their care. ADAPT is an "oasis" where individuals can find support, recovery education and skills, symptom relief and hope for their future. Ren Autrey, CPC Facilitator of the Vancouver Hearing Voices Network Support Group also shared about the local HVN monthly meeting that has been gathering at CVAB's Reach Center on Second Monday's of the month. Those who seek support in their experiences are welcomed to join in the group that creates a space on second Mondays of the month to discuss topics related to hearing voices, seeing visions, and having unusual or extreme sensory experiences. Vancouver WA Hearing Voices meetings are free, veteran friendly and facilitated by people with lived experience. Welcomed first-line care givers or supportive family members will not be turned away, but group priority is given to those with personal experiences. There is a new Vancouver Working Peers Support Group meeting monthly over lunch! Vancouver Working Peers will meet in July at Partners in Careers(PIC) where Andrew Westlund will speak to us about the NW Promise program that is designed to support efforts to build a health care system where the health care worker population reflects the population they are serving, and Lynette Ferguson will speak about seeking participants for the Empowering Women program that is looking to enroll 15 women who are 21 or older that are ready to take the next step towards becoming successful and building connections in their community! Come learn what these "PIC" programs are all about!